Edgartown police officer Jamie Craig of Edgartown served up tasty ginger bread for annual community lunch. Intoxicated drivers, hunting complaints and a theft kept Island police busy over the weekend. In Edgartown, officers served a community meal. In Oak Bluffs, police responded to three separate OUI incidents over the weekend, according to Sgt. Michael Marchand. On Friday evening, police responded after an intoxicated 43-year-old resident crashed his car into someone’s porch near the public bathrooms on Kennebec avenue. The man was charged with OUI (second offense), leaving the scene of an accident, operating after suspension of a license and negligent operation of a motor vehicle. A few hours later, at about 12:05 a.m., police identified a 67-year-old Vineyard Haven man who was driving while drunk. He was initially stopped for a defective light, police said, and later arrested and charged with OUI, operating after suspension, defective equipment and operating to endanger. On Saturday afternoon at about 2 p.m. police got a call from someone who witnessed an apparently intoxicated woman get into her car and back into a wall by the Washashore Laundromat, Sergeant Marchand said. The 56-year-old woman from Vineyard Haven was stopped and charged with OUI (liquor), negligent operation of a motor vehicle and marked lanes violation. In West Tisbury, Chief Matt Mincone said officers received several complaints about hearing firearms discharging, but he said police did not find any hunters in violation of regulations. Chilmark Chief Jonathan Klarén said his department received similar complaints and found no violations. Shotgun season for deer hunting ends Dec. 8. In Aquinnah, Chief Randhi Belain said Aquinnah police responded to an incident of larceny at the Orange Peel Bakery on Thursday. Security cameras captured a woman taking cash, baked goods and merchandise totaling $42 from the bakery. According to the police report, a suspect was identified and interviewed. In Edgartown, Officer William Bishop reported a successful community meal with police and elders. 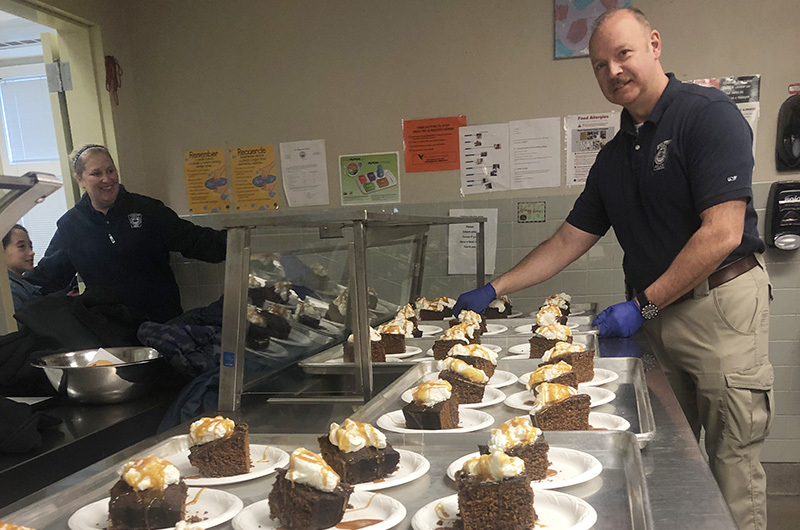 In an annual tradition, officers prepared and served meals at the Edgartown School. Mr. Bishop also said police would be holding a toy drive for the Red Stocking Fund on Dec. 8 at the foot of Main street. Lieut. Eerik Meisner of Tisbury reported a quiet weekend.